Home ⁄ Frequently Asked Questions ⁄ Why are CLEARFIL SE BOND 2 & CLEARFIL MAJESTY ES-2 classic shades the perfect pair for all your direct restorations? CLEARFIL SE BOND 2 has an improved catalyst chemistry for an even stronger bond. CLEARFIL SE BOND 2classic shades offer intuitive shade matching with only a single shade. It is the only composite with VITA Approved Shades which match the VITA Classical Shade Guide. CLEARFIL SE BOND 2 has all the features you love about the original CLEARFIL SE BOND, but with a higher bond strength. The material still offers you ease of use, and predictable success with your composite restorations. 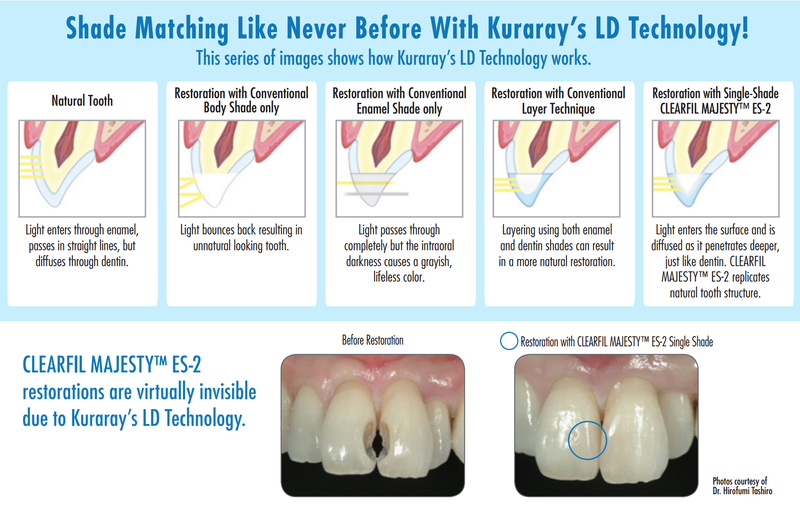 CLEARFIL MAJESTY ES-2 has LD technology (light-diffusion), which makes your composite restorations look lifelike. The chameleon effect makes the composite blend beautifully. CLEARFIL MAJESTY ES-2 offers VITA Approved Shades, thereby making shade matching easy. CLEARFIL SE BOND 2 and CLEARFIL MAJESTY ES-2 are the perfect ingredients for your direct restorations.